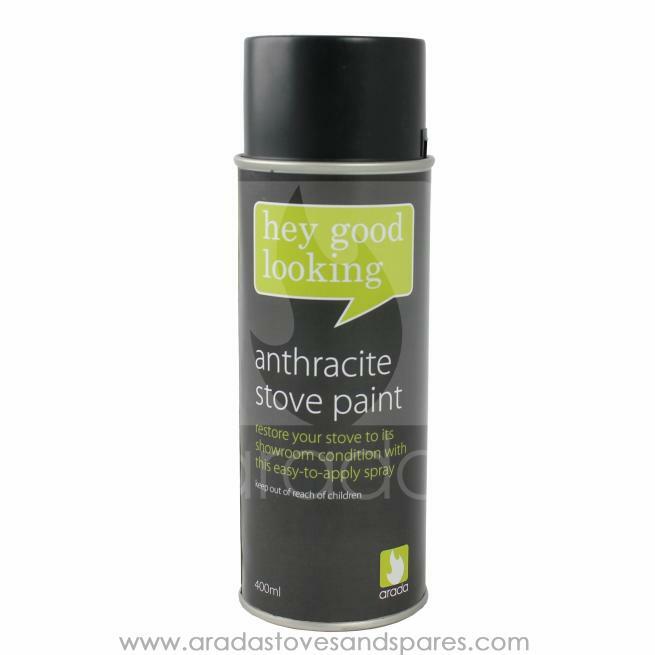 Restore your wood burning stove to its showroom condition with this easy to apply spray. Before applying observe safety precautions. DO NOT APPLY TO HOT SURFACES. DO NOT SMOKE NEAR OR WHILE USING THIS PRODUCT. Extinguish fires, flames and hot coals. Turn off all pilot lights, stoves, heaters, electric motors and other sources of ignition during use and until all vapours are gone. Surface temperature should be between 16°C and 25°C. Remove all dust, rust and grease; scrape off any loose paint from the surface. Any glossy paint must be roughened with sand paper. Protect the surrounding areas from spray mist. Air temperature from 21°C to 27°C is optimal for spray application. Do not paint at less than 5°C. Shake can vigorously for at least one minute after mixing ball rattles. Point opening of spray button towards object, holding can 300mm - 375mm from surface to be painted. Press spray button firmly. Use steady, even strokes. Several thin coats give better finish than one heavy coat. If clogging develops, remove spraying button with a twisting motion and clean. DO NOT stick pin or other object into can. Gently replace spray button with a twisting motion with top of can and spray button pointing away from you. Clean spray button immediately after use by inverting can and pressing spray button until only propellant (no paint) escapes. Discard empty can into waste bin. DO NOT place in home garbage compactor or burn.